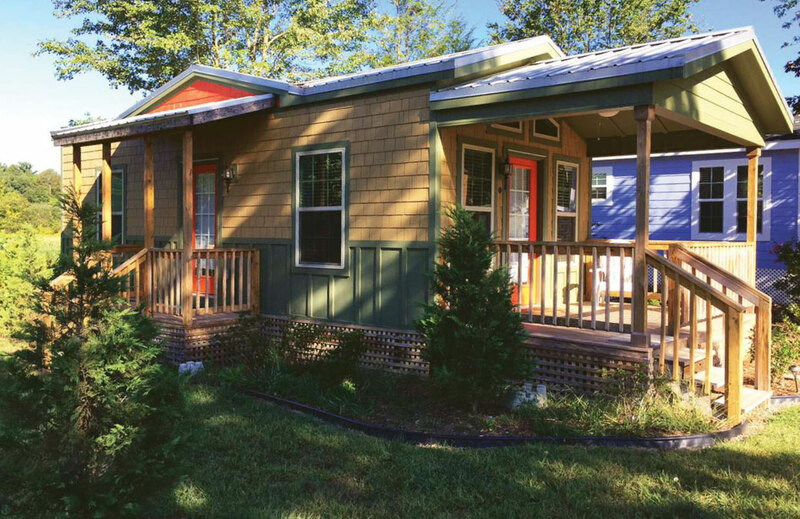 For the Village of Wildflowers in Flat Rock, the motto is “Smaller is Smarter.” At the tiny house community, founded in 2014, homes are sized between 400 and 800 square feet, reflecting a national trend that appeals to those who are looking to simplify and declutter their lives. Founded by W. W. Gilman, a real estate developer and devotee of downsizing, the site has 20 units on a 26-acre former RV park just off I-26. The community—among the first of its kind in North Carolina­—features ponds, a pool, a fenced pet area, and a clubhouse/visitors center. There are several permanent residences plus rentals available to those seeking a quaint, no-fuss getaway. The tiny house movement runs counter to decades of increases in the average size of new single-family homes. Gilman speculates the shift stems from the recent recession. “The logic caught on that you occupy very little space in your residence, so why pay the costs?” he says. “It was discovered that when you cut down your home size you also eliminate a lot of unnecessary material possessions.” House prices at the village begin at around $50,000 and go up to about $90,000, with the land beneath them leased from the community. Gilman is delighted to have some younger folks as part of the community. While the smaller homes are especially attractive to retirees, he says he wants the village to be a multigenerational haven where residents can learn from each other, including a simpler, lower-stress way of living.